KBB.com 10 Coolest Cars Under $25,000. Boasts 31 Highway MPG and 22 City MPG! 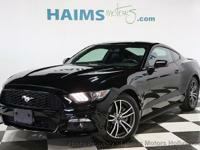 This Ford Mustang boasts a ENG: 2.3L ECOBOOST engine powering it's sleek transmission. Wheels: 18/ x 8/ Magnetic Painted/Machined -inc: Aluminum, Trunk Rear Cargo Access, Trip Computer. *This Ford Mustang Comes Equipped with These Options *Transmission: 6-Speed Manual, Tires: 18/, Tire Specific Low Tire Pressure Warning, Systems Monitor, SYNC w/MyFord Touch -inc: 8/ color LCD center stack touch screen, enhanced recognition communications and entertainment system, 911 assist, multi-function display, AppLink and 2 smart charging USB ports, Strut Front Suspension w/Coil Springs, Streaming Audio, Speed Sensitive Variable Intermittent Wipers, Spare Tire Mobility Kit, SiriusXM Radio (subscription required). * The Votes are Counted *KBB.com 10 Coolest Cars Under $25,000, KBB.com Our 10 Favorite New-for-2015 Cars, KBB.com Brand Image Awards. * The Experts' Verdict...*As reported by KBB.com: What do a Mustang coupe and an F-150 truck have in common? They're reinvented for 2015, and they each have their loyalists. Ford allegiances aside, the Mustang attracts with its newly refined ride and amenities, retro-modern looks and the sheer appeal of owning a performance-car icon with a sub-$25,000 starting price. 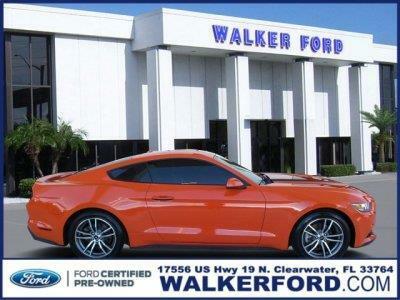 * Stop By Today *Come in for a quick visit at Walker Ford, 17556 US 19 N, Clearwater, FL 33764 to claim your Ford Mustang! Walker IS Ford! Invoice Pricing? Employee Pricing? Tired of the gimmicks? Get the lowest price, the best customer service and HUGE selection every time at Walker Ford. Stop in today, we are conveniently located off US 19 in Clearwater, view the map for direction, and don't forget to check out our 5 star reviews while you're at it! Fuel Consumption: City: 22 Mpg|Fuel Consumption: Highway: 31 Mpg|Remote Power Door Locks|Power Windows|Cruise Controls On Steering Wheel|Cruise Control|4-Wheel Abs Brakes|Front Ventilated Disc Brakes|1St And 2Nd Row Curtain Head Airbags|Passenger Airbag|Side Airbag|Rear Spoiler: Lip|Bluetooth Wireless Phone Connectivity|Digital Audio Input|In-Dash Single Cd Player|Sync With Myford Touch|Mp3 Player|Siriusxm Am/Fm/Satellite Radio|Radio Data System|Siriusxm Satellite Radio(Tm)|Speed Sensitive Audio Volume Control|Surround Audio|Total Number Of Speakers: 9|Intercooled Turbo|Braking Assist|Abs And Driveline Traction Control|Stability Control|Privacy Glass: Light|Machined Aluminum Rims|Wheel Diameter: 18|Wheel Width: 8|Driver And Passenger Knee Airbags|Front Fog/Driving Lights|Leather/Aluminum Steering Wheel Trim|Leather/Aluminum Shift Knob Trim|Aluminum Dash Trim|Video Monitor Location: Front|Trip Computer|External Temperature Display|Tachometer|Manufacturer's 0-60Mph Acceleration Time (Seconds): 5.3 S|Power Remote Driver Mirror Adjustment|Heated Driver Mirror|Heated Passenger Mirror|Electrochromatic Rearview Mirror|Power Remote Passenger Mirror Adjustment|Turn Signal In Mirrors|Dual Illuminated Vanity Mirrors|Compass|Driver And Passenger Heated-Cushion| Driver And Passenger Heated-Seatback|Remote Window Operation|Audio Controls On Steering Wheel|Power Remote Trunk Release|Front Reading Lights|Anti-Theft Alarm System|Leather Seat Upholstery|Bucket Front Seats|Rear Bench|Fold Forward Seatback Rear Seats|Tilt And Telescopic Steering Wheel|Speed-Proportional Electric Power Steering|Suspension Class: Regular|Driver Adjustable Suspension Ride Control|Interior Air Filtration|Automatic Front Air Conditioning|Dual Front Air Conditioning Zones|Tire Pressure Monitoring System: Tire Specific|Remote Activated Exterior Entry Lights|Cargo Area Light|Max Cargo Capacity: 13 Cu.Ft.|Vehicle Emissions: Lev Ii|Fuel Type: Premium Unleaded|Fuel Capacity: 15.5 Gal.